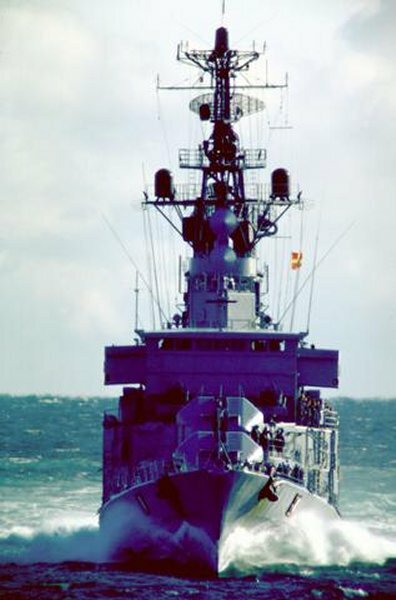 German Hamburg class destroyer of 3340 tons displacement launched in 1960. 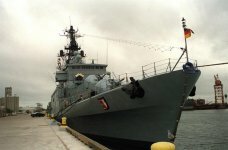 In the period 1960 to 1968, four Hamburg Class destroyers were designed and built at the Stülcken yard to the same level of technological development as that of the Cologne Class frigates. 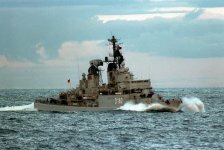 During the seventies, they were the largest units in the German Navy and at the same time the backbone of the naval forces in the North Sea. They too were intended primarily for convoy duties but, as far as their armament was concerned, were also equipped for anti-ship combat and coastal bombardment. Due to the high speed they were required to achieve, these destroyers are fitted with a high pressure superheated steam propulsion unit. Two Wahodag geared steam turbines rated at 68000 shp provide a top speed of 34 knots and a range of 9600 km at 13 knots and 1475 km at 34 knots. She is manned by a crew of 268 including 19 officers. 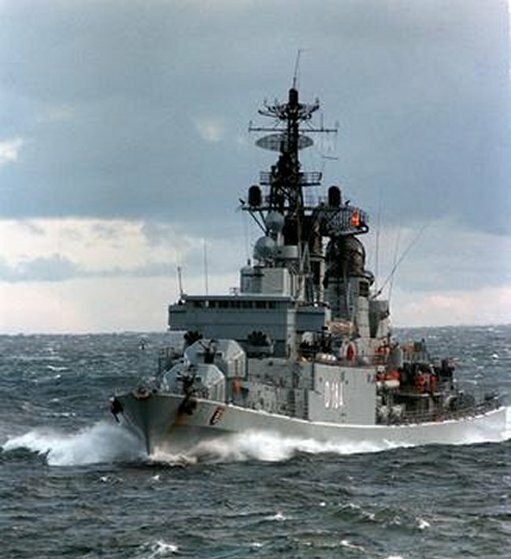 Armaments consist of four Aerospatiale MM 38 Exocet anti-ship missile launchers arranged in two twin settings; three DCN 100 mm/55 Mod 1954 dual- purpose guns; eight Breda 40 mm/70 in four twin mountings, anti-aircraft guns; four 533 mm single torpedo tubes; two Bofors 375 mm 4-barrelled trainable anti-ship mortars two depth charge projectors; and has the facility for laying mines. 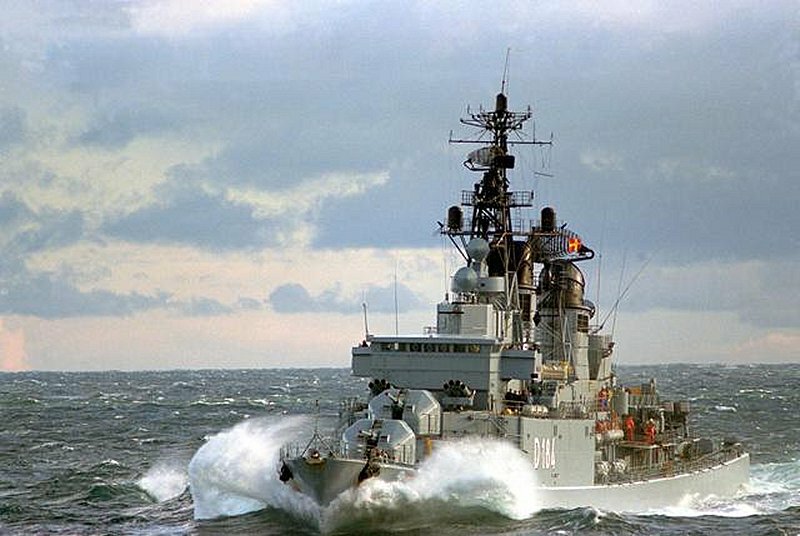 The three units of the 'Hamburg' class were commissioned in 1964-65 carry a mixed anti-surface and anti submarine armament. 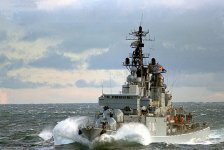 As constructed they were little advanced from World War II ships, with four 100-mm guns, anti-submarine mortars and standard 533 mm torpedo tubes. 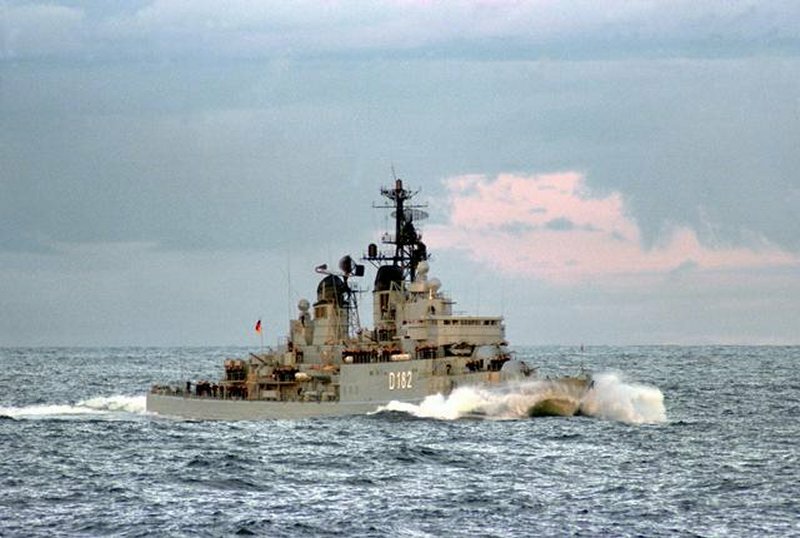 In 1975, large sections of the ships were modified to keep pace with ongoing technological development. 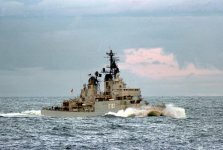 The third 100 mm turret was replaced by two EXOCET missile launchers, Breda 40 mm guns instead of the old-style Bofors guns, and the anti-submarine torpedo tubes by later versions. The permanently installed torpedo tubes for targets at sea in the bow and transom were removed and the apertures welded over. 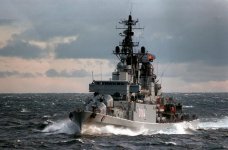 The operations center was modernised, radar antenna and bridge replaced. Nevertheless, their anti-aircraft armament was weak by modern standards. 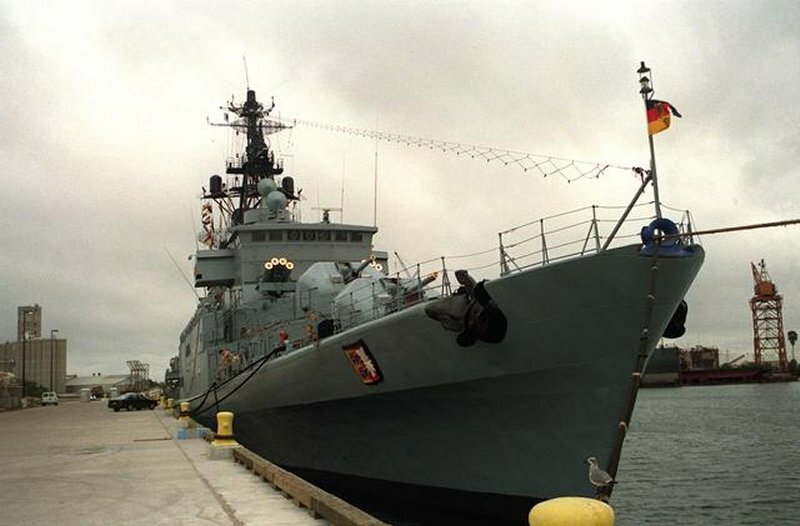 The destroyers of the 'Hamburg' class are no longer in service. 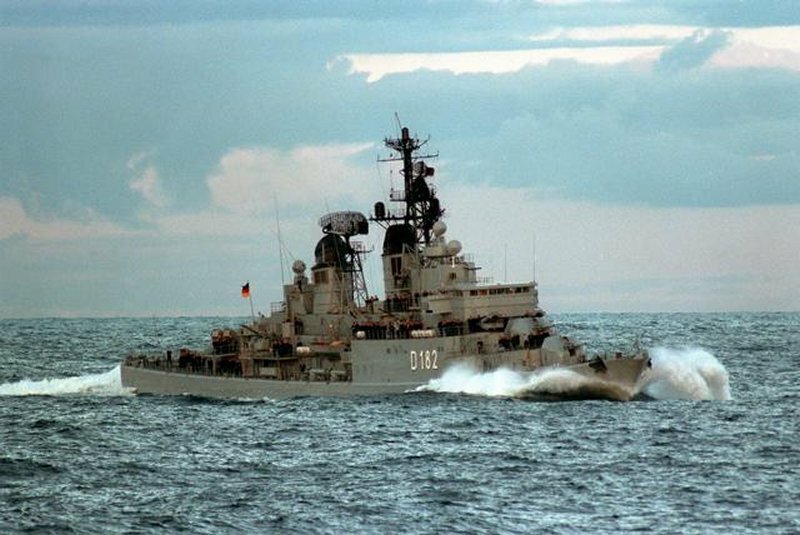 The destroyer Hessen was decommissioned early due to unacceptable costs of upkeep. The other three ships were replaced by Class F123 frigates from 1994 onwards. Hamburg D 181 26. 3. 60 23. 3. 64 . .
Schleswig-Holstein D 182 20.8.60 12. 10.64 . .
Bayern D 183 14. 8. 62 6. 7. 65 . .
Hessen D 184 4. 5. 63 8. 10. 68 . .